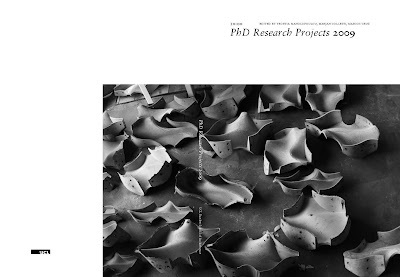 Manolopoulou, Yeoryia; Colletti, Marjan; Cruz, Marcos (editors): PhD Research Projects 2009, Proceedings Catalogue, UCL, 2009. Perhaps it is inevitable that an architect may conceive of a PhD in architecture as a dynamic morphological entity: its content and structure, and also its shape – or in better terms, its Gestalt – being constantly adapted, evolved and reiterated throughout the process of writing and designing. More than just a shape, or a random form, a Gestalt is a whole that conveys attributes that cannot be derived from the simple addition of its individual parts. The formula that generates research cohesion is far more complex than adding information, and is thus impossible to write. Yet at the same time, it is required that a published paper and (of course) a finished PhD must have a clearly defined Gestalt. It is fair to say that most larger-than-its-parts pieces of research emerge from serial theoretical and methodological principles and exercises. Hence one could argue that only a strict methodological and linear extrapolating research protocol that exploits emergence as a generative output can lead to a rigorous PhD. But even then, its morphology can only be described as approximately exact, as variations in decisions and process would inevitably produce different outputs. I would therefore suggest that an interpolating research strategy that is instead more synthetic – as it introduces something new between an array of existing elements – may result in the emergence of far more exactly approximated rigorous PhDs and their Gestalten. It is this aspect of interpolated emergence that characterizes many of the here featured research by design projects and processes, as they are not merely generative (as in formalizing thoughts), but arise from an approximative and dynamic setup of experience and experimentation, method and serendipity. Furthermore, as one of the main tasks for a student pursuing research by design, or by practice, is to find a strategy of combining text and projects without falling into the trap of one becoming the description or the illustration of the other, such a programme is interpolative – and thus approximative – by nature. Yes, approximation is a dangerous term to use in the context of academic research, but bear in mind that all papers featured in this proceedings catalogue are work in progress, and hence they are only an approximatively exact part of an anexact yet definitely maybe rigorous Gestalt.